File Photo - Russia's Maria Sharapova hits a shot during a practice session at Melbourne Park, Australia, January 14, 2016. Former world number one Maria Sharapova eased past defending champion Peng Shuai 6-3 6-1 at the Tianjin Open on Saturday to reach her first WTA final in almost two and a half years. 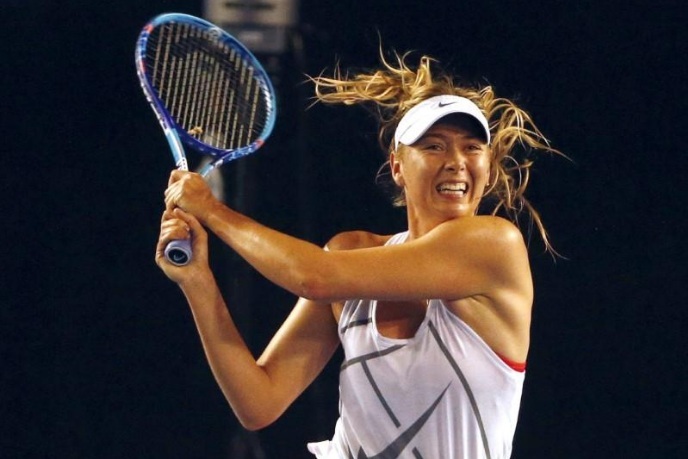 Sharapova, who returned to the tour in April following a 15-month doping ban, will meet teenaged Belarusian Aryna Sabalenka, who is ranked 102 and made her first WTA final after beating Italy’s Sara Errani 6-1 6-3 in the other semi-final. The Russian, who is currently ranked 86, broke her Chinese opponent in the opening game and rarely looked troubled on her own serve. Peng, ranked number 25 in the world, had no answer to Sharapova’s power hitting from the baseline and gave up another break en route to conceding the first set. Sharapova, who is yet to drop a set in Tianjin, raced into a 3-0 lead at the start of the second but suffered a brief bout of nerves while serving for the fifth game, when she was forced to save three break points. The 30-year-old turned the tables on Peng in the very next game, breaking her opponent once again before closing out the contest in 78 minutes. It will be Sharapova’s first WTA final since she defeated Spain’s Carla Suarez Navarro to win the Italian Open in May 2015.